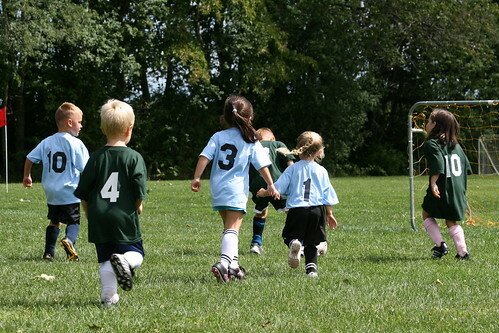 Since Dova's big brother is a soccer star and she is always trying to keep up with him, you'd think that she would be excited to start in her first youth soccer team. 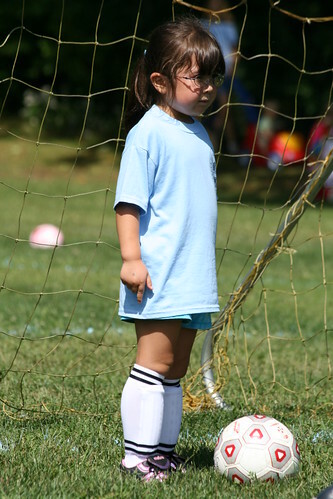 She's done two soccer camps already, each time starting out well because she wanted to be with her brother, and ending up with her not wanting to go anymore. We assured her that the soccer league was not as intense as the camp and that there would be plenty of boys and girls her age. Dova's first game of the season started on a bad note. We were running late for the pre-game practice and approached the fields with what seemed like hundreds of kids in blocks of different colored shirts already in practice. It must have looked overwhelming to her and she started to say, "I don't want to go!" She tried to pull my arm and drag me back. She started walking back to the car herself, but seeing that her whole family was still marching ahead, she reluctantly followed. I was afraid that she was really going back to the car or even walking home, because she's got that kind of temperament (I blame my friend who shares the same birthday as her). We said hello to her coach, and told him that she was being a little shy. He said not to worry, she can play when she's ready. So we sat on the edge of the fields and watched all the other kids practice. They were all running around doing fun drills, laughing and listening to the coach. I looked around and saw no other little kids glued to their mom's lap. We tried to engage her by bouncing the ball off her feet or having Adam play with her. But she refused to budge. The coach checked in a few times, but she did not move. At one point, we dragged her off the chair but she ran back to it and toppled it over. She started to cry and scream that she just wanted to go home. At this point, Doug thought it was a lost cause and was ready to take her home. But the tough mom that I am refused to give up. I kept holding her and talking to her until she calmed down. Of course I couldn't take photographs of her in this state as this would have meant the end. By this point, the practice was over and the game was beginning. Three players were in the field and there were two subs, with Dova being a possible third sub. After a rotation, I told Dova, "Look, the coach needs you sub, are you ready to play?" And miraculously, she said yes. She got up and I motioned to the coach that she was ready to play and he put her in. We couldn't believe it. It was somehow the magic bullet that got her to play. She ran around, dribbled the ball a few times, and looked like she was even having fun. After finally peeling her off my lap, I took out my camera. Dribbling the ball down the field. She didn't touch the ball too many times, but when she did, I was shooting away. Kicking the ball and looking where she's going. Don't you love those pink cleats? Where's the ball? 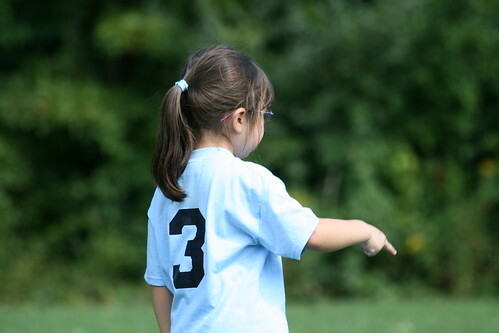 The coach asked the players to point to the ball so they knew where it was. I just like this shot because of the bokeh (blurry background). All these shots were taken with a Canon Rebel XTi, 70-300mm f4. 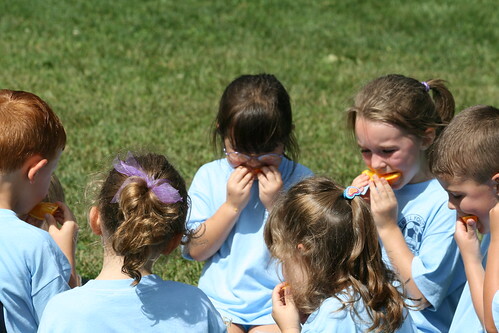 Dova ate oranges at half-time with her team. Integrated right in like nothing happened. Unbelievable! 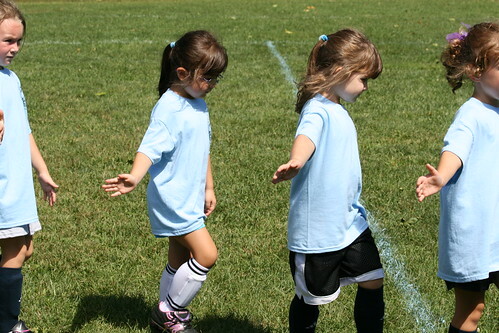 Getting ready for a goal kick. 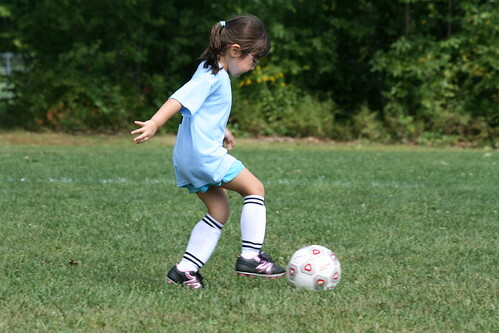 She was still a bit tentative about playing, but did everything the coach asked her to do. I love the fact that she's still shorter than the top of the goal. 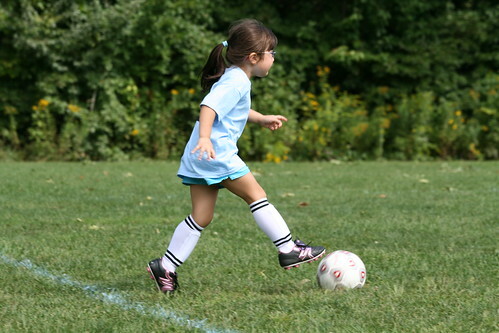 My baby girl is playing soccer! Lining up for the "good game" slap. Looks like she's got the soccer hairstyle down. Afterwards, I asked her if she had fun and if she wanted to do it next week. She said yes! By the time the next game rolled around, it was back to her old antics. I missed it because I took Adam to the NASCAR race. Oh well, I'll be sure to take her to the next game and rev her up again.